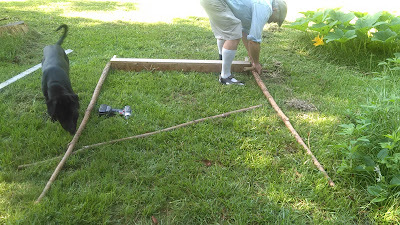 He screwed it securely to the board beneath. I also bought a new chicken feeder for $10 at the local farm store. 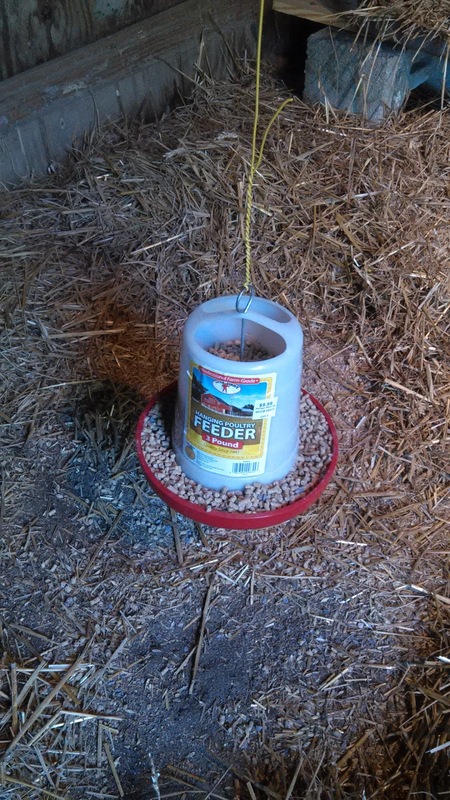 The big clay dish I was using was really inadequate because they would stand in the feed while eating and scatter it around. This one hangs from the ceiling. Hopefully they won't make a pig's breakfast out of it! 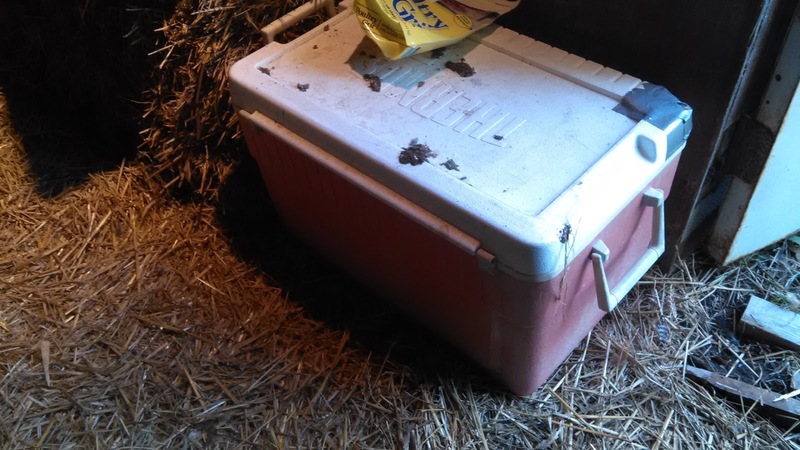 I keep their feed and grit in this cooler, which has worked very well. No mice in it, no bugs. 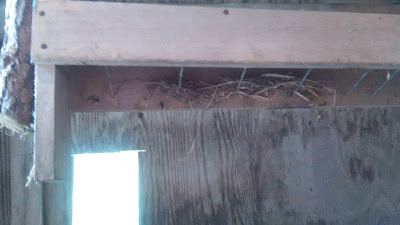 It was sitting on top of that straw bale, and because it was the highest flat surface in the coop ... yep, you guessed it ... that's where they roosted! Thus, lots of poop on the cooler lid every morning. Sigh. Finally we decided on a new roost arrangement. First we pulled everything out of that corner. Remember the old roost? 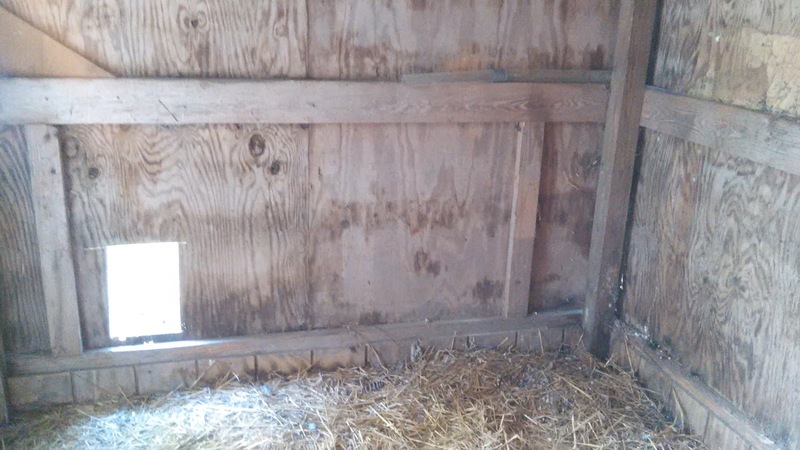 And that nasty feeding box behind it for the little horses that used to live here? Adam looked at that feeder box and thought, 'Hmmm. I can use that.' So he attached it to two pine poles on either side. 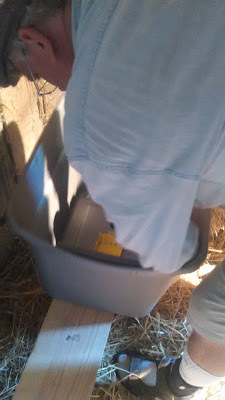 He turned the feeder box upside down so the chickens would have a nice smooth surface to roost on. 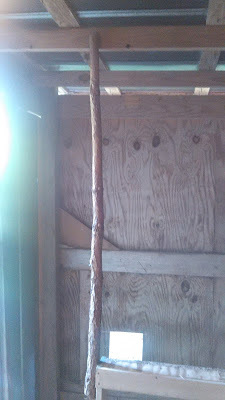 And he suspended it from the ceiling rafter in the coop. Now we have a hanging roost. And considering how weird my chickens are about roosting, I'm hoping this will help limit their options. 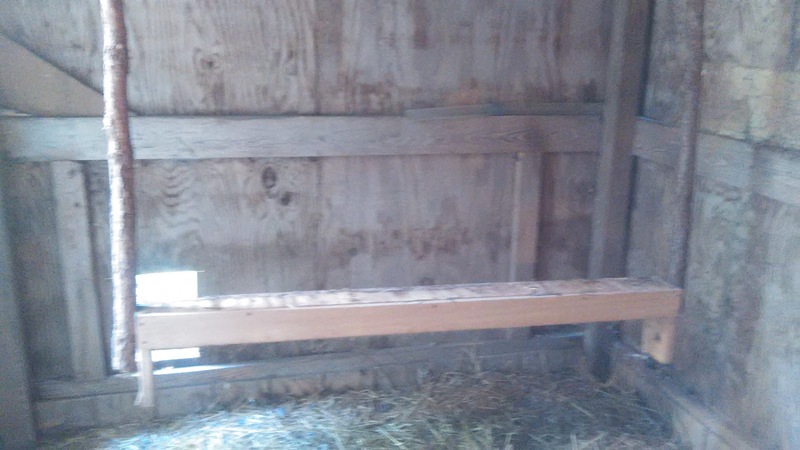 This roost is now the highest spot in the coop, so they ought to choose it. It's plenty long enough for all of them. I mean ... last night I came out to put them to bed. FOUR of them were squashed up on top of the cooler! 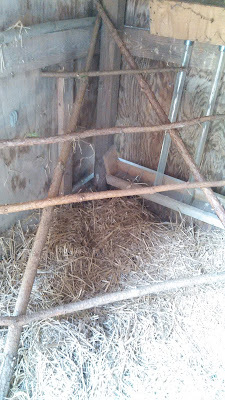 Mr. Bernie (the roo) was hiding underneath three hens! And poor Ethel was all alone on the old roosting frame, hanging for dear life on one of the sloping pine branches. Not good. I'm hoping so very much they will like this roost. After Adam finished and we both left the coop, they all five cautiously came over to their little door and peered in. 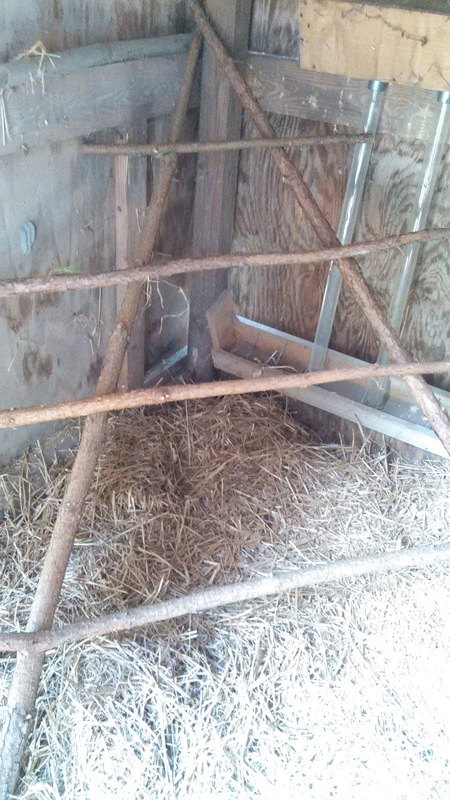 They were too afraid to examine the changes in their home, but they desperately wanted to! They are so funny. I could watch them for hours if the mosquitoes didn't drive me back into the house. I love how individual and quirky hens are! Hope they like your roost, that looks good!! Like a hen swing!! I didn't realise there was so much to think about when keeping hens. You are a mine of information. Sounds and looks like some great ideas for the chicken. I think one of these days I might give raising chickens a try. Seems so many people are doing it now. Chickens are so funny about roosting. If I left my feed in the coop, they'd be on top of it pooping too. 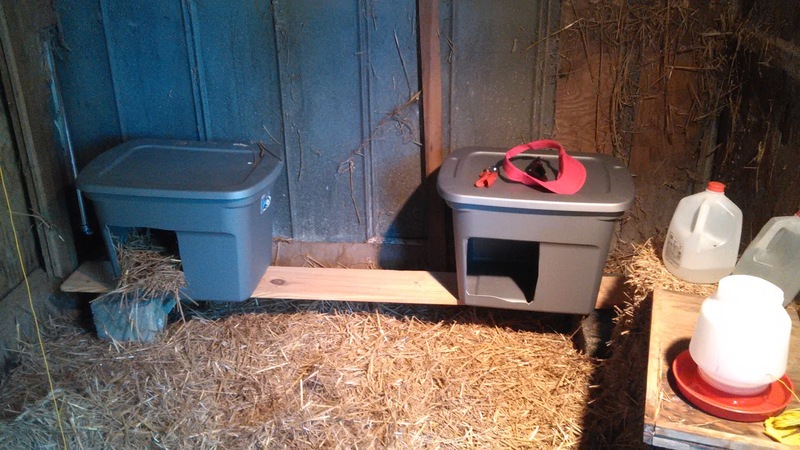 I put my feed in trash cans with lids in the other side of the coop -- no poop. Your roost looks good. I think they'll get there eventually. They start habits and they don't change quickly. Your coop looks so fresh and nice. I really need to clean mine again. You're going to have some happy chickens.